Brand Intelligence™ firm marks its move from Sandton to the inner city by championing Johannesburg artists and raising funds for Malvern Primary School. 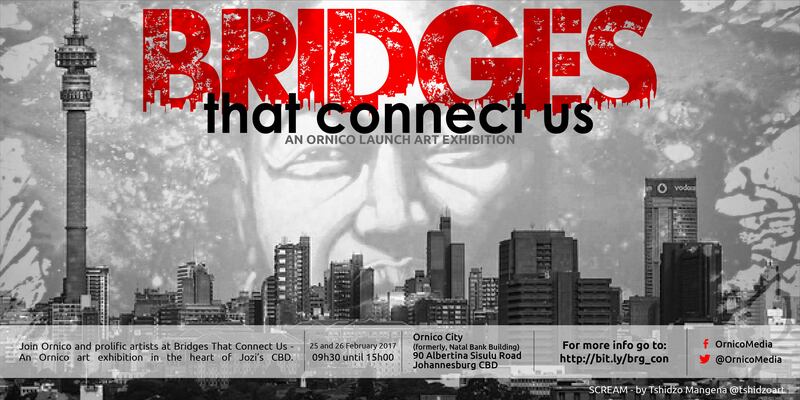 Thursday, 09 February 2017 – Johannesburg, South Africa: To celebrate its move from Sandton into Johannesburg’s heartland, marketing research firm Ornico will be cutting the ribbon on its new inner city premises on Thursday 23 February 2017 at 18h00 for 18h30. As part of the celebrations, Ornico will host an auction of art to raise funds for Malvern Primary School which is situated on the corner of Jules and Frere Streets in Malvern, Johannesburg. Ornico acquired the old Natal Bank Building situated at 90 Albertina Sisulu Road, in Johannesburg in January 2016. The building was provisionally declared a national heritage site in 1990, and is the oldest standing bank building in Johannesburg. Built immediately following the Anglo Boer War and occupied in 1903, the original construction cost of the building was £29,847. Just one block from the Johannesburg Stock Exchange and the National Bank of the South African Republic, the Natal Bank overlooked the old market square, on what was then Market Street. The building was empty, beginning to fall into a state of disrepair, and desperately needed refurbishment. Ornico has spent the last six months working with Sakhive Construction, a Jozi based construction and restoration company, to repair and renovate the site. To commemorate the research firm’s move to this heritage site, Ornico will be holding an art auction and exhibition, called ‘Bridges That Connect Us’, featuring some of the city’s top artists. “Ornico’s clients include some of South Africa’s top brands, and we invite these brand leaders to meet some of Jozi’s most valuable and emerging artists. Join us at a unique inner city event, at this historic heritage venue,” says Patricios. “By supporting local, Jozi-based art and artists, we believe we celebrate Jozi’s unique culture and history. Art is a language that helps us understand each other, both in pain and in joy. It also creates opportunities for related endeavours, like design and innovation, and definitely contributes to economic growth through attracting cultural tourism and even encouraging investment,” the Ornico CEO adds. While the auction takes place on Thursday 23 February at 18h00 with almost all of the artists present, the public will also be able to see the work. People who live, work and play in Johannesburg are also invited to view this art exhibition on Saturday 25 and Sunday 26 February 2017 from 09H00 to 15h00. Mbongeni Buthelezi: An internationally acclaimed artist, Buthelezi gained renown for brightly-coloured collages made from waste plastic. However, now he manufactures his own plastic in the specific colors and density he requires. Buthelezi studied as artist-in-residence in Germany and the USA, and has exhibited at the Melrose Gallery. His work is part of official collections, including the Museum for African Art in New York, Johannesburg Art Gallery and the Spier Collection. Tshidzo Mangena: Working mainly in charcoal, acrylic and oil, Mangena’s vibrant and unexpected colour combinations create works that are rich and emotive. Mangena is inspired by human emotion, and the beauty and the mystery of the African woman. Often his work reflects his love for jazz music and the grace and elegance of jazz instruments. Solomon Omolayo Omogboye: Working mainly with charcoal, pastel, acrylic and oil on canvas, this Nigerian expat uses colours that explode with movement and emotion. His subject matter is as varied as life itself, ranging from pastel-illumined cityscapes to energy-infused portraits. He works from his own studio space in August House, JHB, which is one of the top artist colonies in SA. Azael Langa: Benoni-born Langa won his first art competition in Grade 6, and discovered his calling studying art in high school. His works range from whimsical and surrealistic to moody impressionist pieces. Langa says that for him, art is a lifestyle. In his own words: “My art is about socio-political activism and going about the subject I show the exploitation of the Average Joe; the corruption of the elite and bringing to the surface that which is ‘out of sight, out of mind’ It is also about taking the intangible events, circumstances and becoming a mediator to the public.” In some of Langa’s more controversial work he targets western icons and South African political figures. Ndabuko Julukani Ntuli: Inspired by his grandfather, a painter and sculptor, Ntuli learned to paint at school and practiced while tending the family cattle in KwaZulu-Natal. His talent was recognised by the Johannesburg Art Foundation, where he was encouraged to hone his skills, especially in the art of oil painting using a palette-knife. He draws inspiration from rural and township life, drawing in traditional iconography and combining modern materials. Johnnyguava: Born John de Gouveia, Johnny deals with self-discovery through his work. His creations use found objects, sometimes adding a comical twist to this serious conceptual base. Also trained as a professional photographer, the objects are removed from the environment they were found in and then transformed into pop-art images or collage, with themes that include decay and transformation. Michael Tshepo Selekane: Born in the politically-charged 1980s in Uitvlag, rural Mpumalanga, Selekane was only encouraged to develop his latent talent in high school, when he moved to Mabopane to be with his mother. Later he was introduced to the Tshwaraganang Arts School in Mabopane, where he was exposed to various media, and developed oil paint techniques. A programme run by the Ifa Lethu Foundation, funded by Ausaid, was held at the centre, where Selekane was selected for further assistance and development. In a competition run by Ifa Lethu, Selekane won first prize for painting, and he gained the support of BHP Billiton. Further education at Tshwane University of Technology’s Faculty of Arts was funded by the Ifa Lethu Foundation, and he has gone on to exhibit at the National Arts Festival in Grahamstown, the World Summit on Arts and Culture in Johannesburg and at various galleries across SA. Dario Manjate Art: A graduate of one of the biggest and most vibrant community and professional printmaking facilities in Johannesburg — Artist Proof Studio — Manjate’s artistic skill includes oils, watercolour, acrylics, printmaking as well as the medium he is best known for — collage. Manjate’s love of art started in Alex, but was honed at Artist Proof Studio, and through various community projects such as “Work To Win,” an environmental awareness project which included several murals created to uplift his surrounding township community. The winner of the Freedom of Expression Art Competition (Gaulloises Blondes) in 1996, in Johannesburg, Manjate’s Curriculum Vitae includes many commissioned pieces by a variety of organizations and corporate companies. He continues to bring his unique approach to the formation of his collages and thus his work is sought after for its extraordinary qualities. Nkhensani Rihlampfu: A painter, print maker and sculptor, Rihlampfu studied Fine and Applied Arts at the Tshwane University of Technology. He realised his B-Tech degree in 2011. Rihlampfu’s uncompromising work speaks to his experience of life in Johannesburg, as well as his understanding of power, spirituality and humanity. This has seen the artist win commissions for Constitutional Hill in Johannesburg and exhibit at Absa’s L’Atelier, the Grahamstown Arts Festival, the Pretoria Art Museum, the Turbine Art Fair, as well as at Arts Alive and the Jo’burg-Jo’burg show. Rihlampfu now works from his own studio space in Johannesburg. Cebo Simphiwe Xulu, aka @Mr_MediaX, is an emerging new-media artist who is attracting attention and interest following his residency at the Fakugesi African Innovation Festival, where he exhibited a set of playing cards called Mambokadzi — based upon African symbols and African queens — in collaboration with Vuyi Chaza and Regina Kgatle. Graduating from the University of Kwa-Zulu Natal in 2011 with a BA Media and Visual arts degree, Xulu — who now calls himself Papichulo — is notable because of his use of technology in art. Xulu graduated in fine arts and media from the University of KwaZulu-Natal, but spent most of his varsity time learning how to live life as the (now deceased) popular underground comic, Mr Njejust. “Since late 2013, I decided to bring all my mother’s worst nightmares to life by trying to live life as an artist and entrepreneur in the creative industry. The nightmare continues to evolve into a beautiful dream,” he says. The auction and exhibition will be curated by Dawn Sarah McGee from MB Studio Community in collaboration with Nantu Palesa Phalatsi from Tshidzo Art. The artists have agreed to donate a percentage of the auction sales to a fund for the Malvern Primary School. “This is just a small start to what will be active, ongoing participation in the city’s life, by Ornico,” says Patricios. “We will continue to support education and the arts, and look forward to meeting our neighbours, working with inner city partners and suppliers, and being part of Joburg’s revitalisation going forward. We sincerely hope our associates, clients and business friends can join us as we mark this milestone of our journey,” he adds.